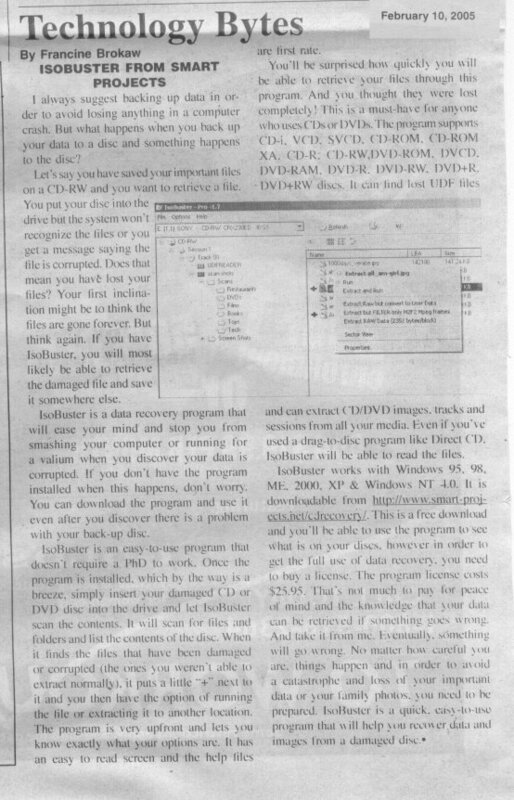 IsoBuster Reviews - Recover Data from Hard Drive, CD, DVD, BD, USB, SD, etc. PCWorld reports "IsoBuster recovers files from just about anything" in a nice review of IsoBuster's functionality and features. "This misleadingly named but surprisingly effective recovery program for all types of media is well worth a look." Read the full story here. PCUPDATE magazine, a very big computer related magazine in France, elected IsoBuster as winner of a rigorous CD and DVD recovery test and as best price quality solution, compared to the competitors. Click on the picture to see the entire article (1,5 MB)(in French). IsoBuster was awarded "Le Choix de la Rédaction" or Editor's choice award. Tucows has awarded IsoBuster 5/5 cows! Click the image to view the website. Microsoft MSDN proposes to use IsoBuster when extracting file from images. IsoBuster reached over 1,000,000 downloads on CNET and thus became a 'Popular Download'! 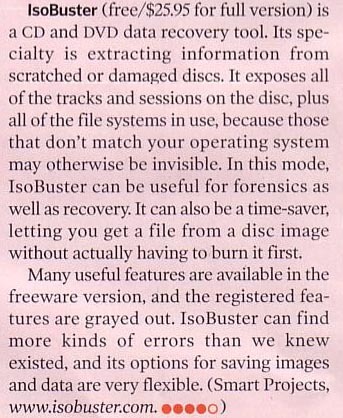 In her column of 11/10/2003 Kim Komando talks about IsoBuster and the recovering of "lost" data from CDs. The website LangaList mentions the 'Ultimate Data Recovery Tool' in their newsletter. 3D2F reported in a review: Now you can understand my amazement with IsoBuster? I really don't know what can be done to damaged disks on top of this suite's capabilities. Read the complete review here. And many more... we lost track (and quite honostly, we don't update this page so much anymore ... better concentrate on making the software better). Additionally, 191 people reviewed IsoBuster and gave it a top score of 5 out of 5. This is a limited list however. There are always more testimonials waiting to be put on the website and there are of course also the testimonials in other languages.